Yea! 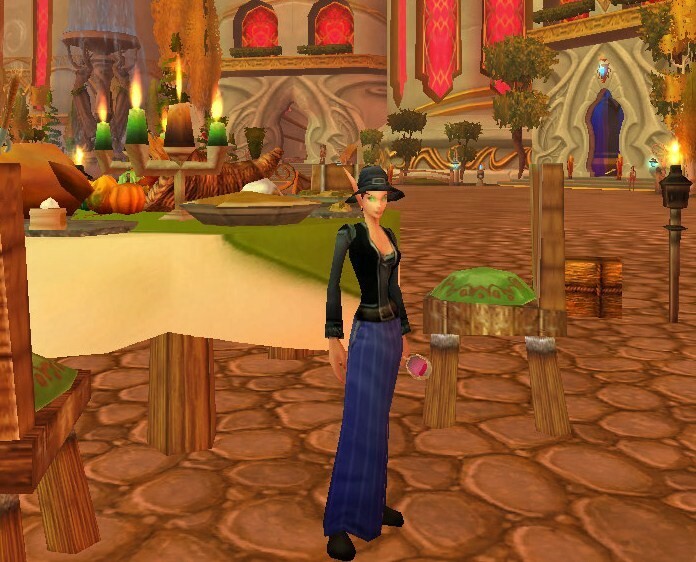 The new world event is finally here (well, for 2009 players ^_^)! 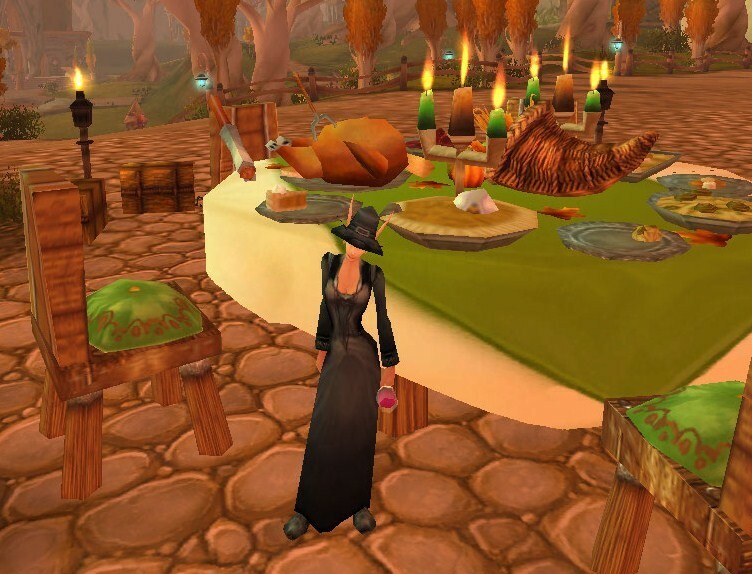 Pilgrim’s Bounty is based upon the traditional American holiday of Thanksgiving. Lots of food, friends, and fun! Anyway, enough about the “history” of this event, let’s get to the outfits! 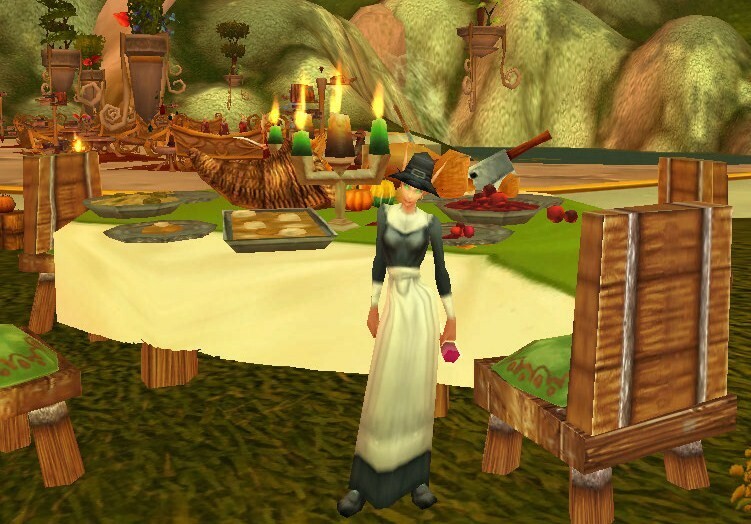 The Pilgrim’s Boots, along with the Pilgrim’s Dress, can be chosen as a reward from one of the Pilgrim’s Bounty daily cooking quests. There is a Pilgrim’s Hat to choose as a reward as well, but, because it shares the same model as Kirina’s Comfortable Leather Hat, I choose not to get it. But, for all you clothies, or those that could never get a hold of the Comfortable Leather Hat (or its previous look-a-likes), this hat is for you! The same outfit with Kirina’s Comfortable Leather Hat. Are you the hostess who loves to cook? 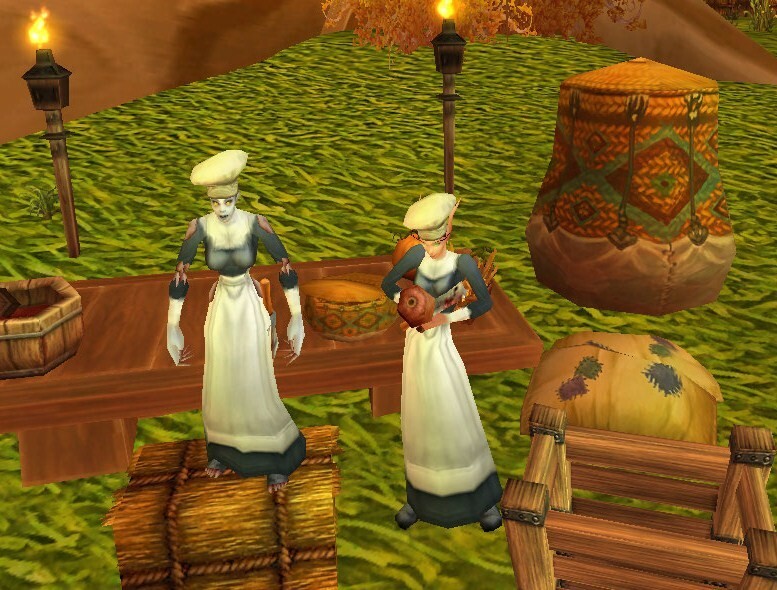 Throw on your Chef’s Hat to look like the Pilgrim’s Bounty Cooking Trainer NPCs. 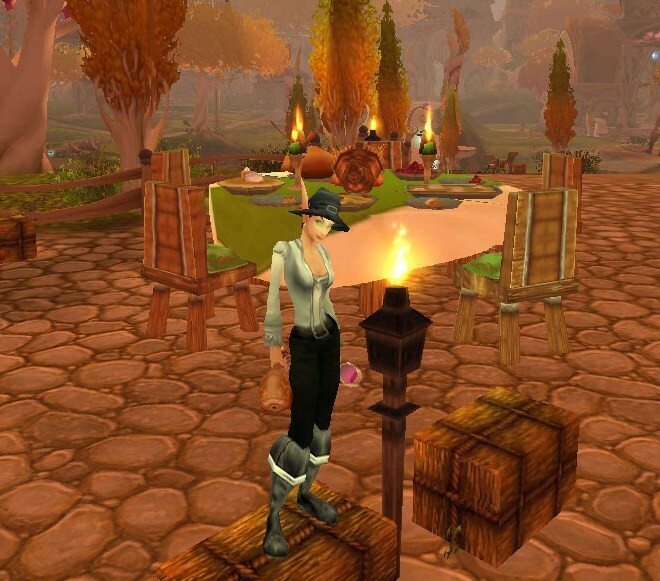 Another outfit that is rewarded through the Pilgrim’s Bounty dailys, the Pilgrim’s Attire, is more for the guys; however, girl characters look great in it as well. 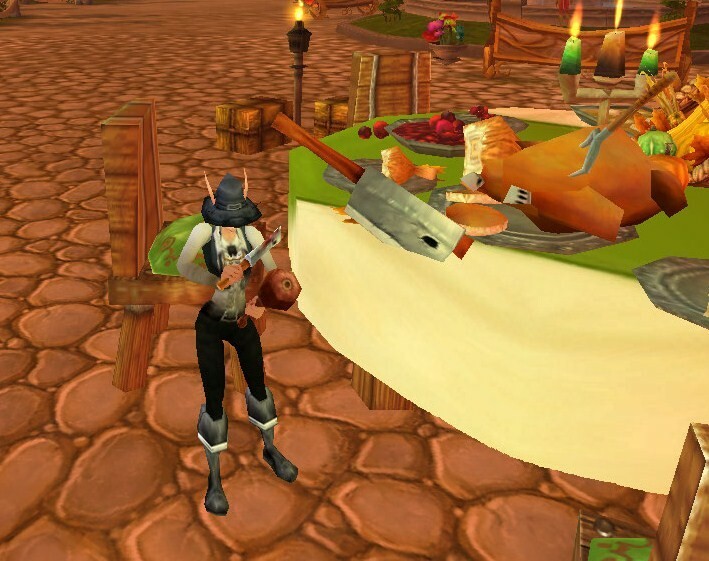 The BKP 2700 “Enforcer” can be bought from several gun vendors around Azeroth. I find the wide barrel on the gun more “musket” like and full of antiquity to compliment the traditional Pilgrim’s Attire. Of course, there are other guns with this same model, but, having something non-BOE and only costs a handful of silver? I’m sold! ^_^ Buy some cheap bullets to actually use the gun and turn this ensemble into your turkey hunter outfit (for all that Wild Turkey meat you need) – very authentic! Other notable off-hands for this outfit would include, the Red Wine Glass, Last Year’s Mutton, or a stein, such as the Ornate Drinking Stein. 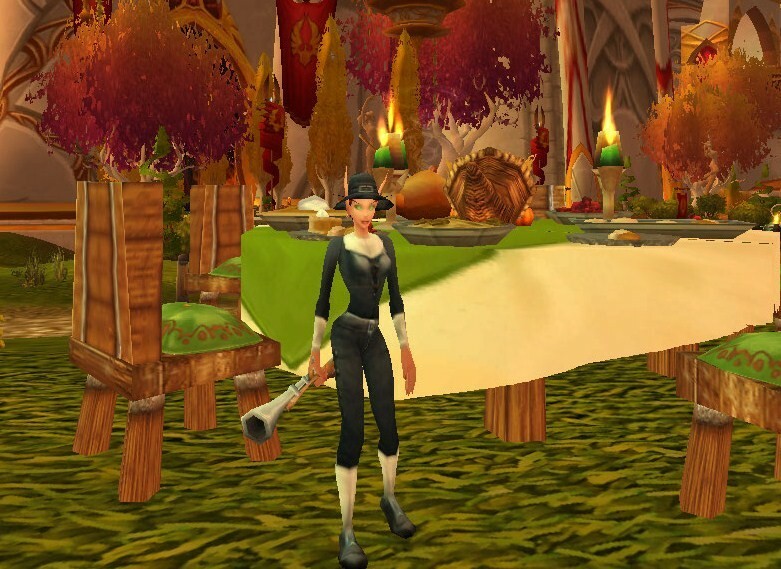 The last clothing item to receive as a reward from the different cooking dailys is the Pilgrim’s Robe. The other two outfits were more “Pilgrim”, of course. The Pilgrim’s Robe is more “Native American,” who, according to the age-old American story, were apart of the first Thanksgiving as well. 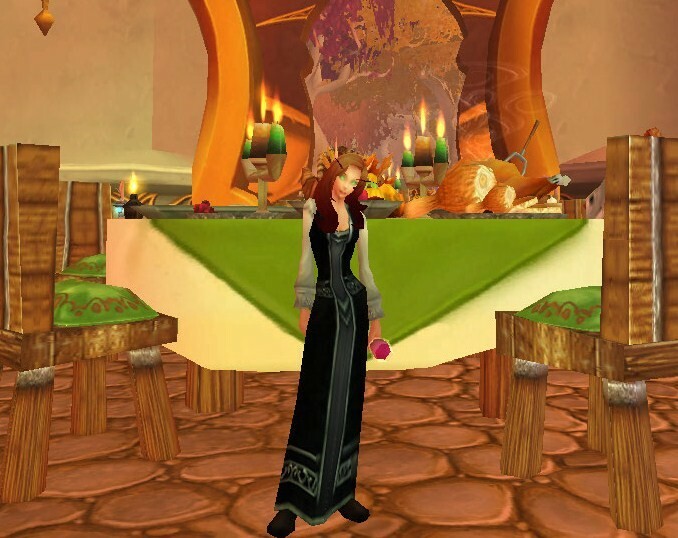 This robe is worn by the Bountiful Feast Hostesses found at all the “Bountiful Tables,” and look great on Tauren and Night Elf players. 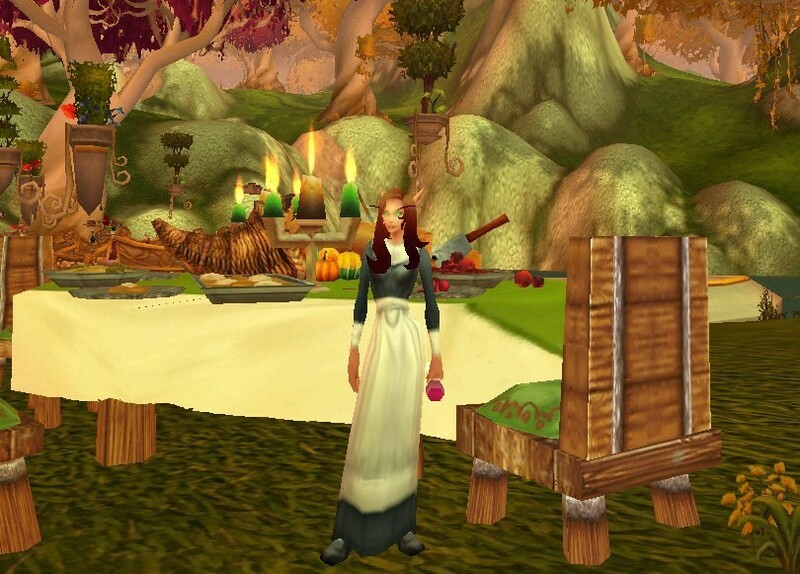 The robe style is found in many other common and uncommon cloth robes, like the Novice’s Robe or the Native Robe, and can be a great Druid, or even a Shaman, RP outfit. I added Kirina’s Wise Man’s Belt and her Spirit Hunter Headdress to complete the outfit, but, of course, is completely optional. 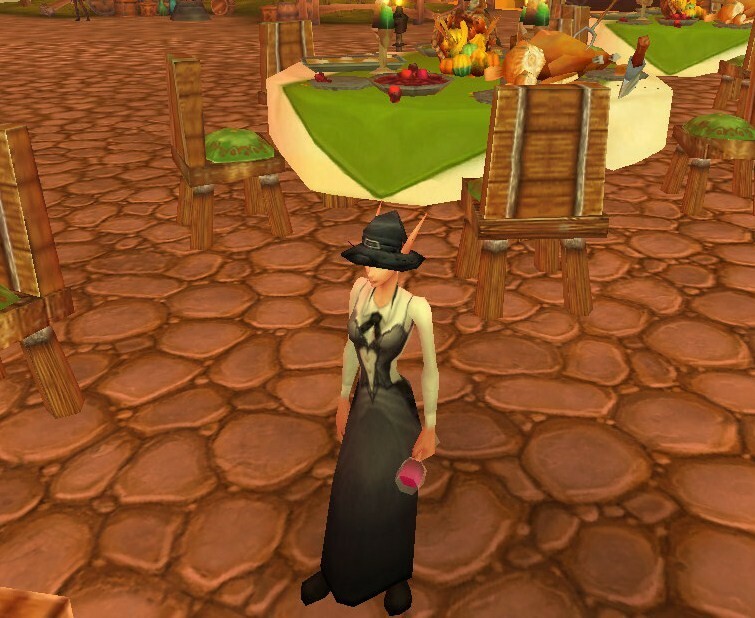 So, that does it for what this world event offers to wear (which is great ^_^). If you want to put together your own original outfit, continue reading for some other ideas. For more dressy trouser outfits, your best bet are a pair of Tuxedo Pants and/or Haliscan Pantaloons. The Shadow Councillor’s Tunic is a great find dropped out of the Outland regions. When paired with the White Tuxedo Shirt, it instantly becomes more dressier. The Buccaneer’s Boots can be replaced for the Pilgrim’s Boots, should that be more desired. The same outfit with the substitution for the Haliscan Pantaloons. The lighter black shading of the Haliscan Pantaloons blends better in color to the Comfortable Leather Hat and to the vest part of the Shadow Councillor’s Tunic without sacrificing the fancy style of the outfit. The Stylish Black Shirt is a great substitute for anyone who desires to wear it. 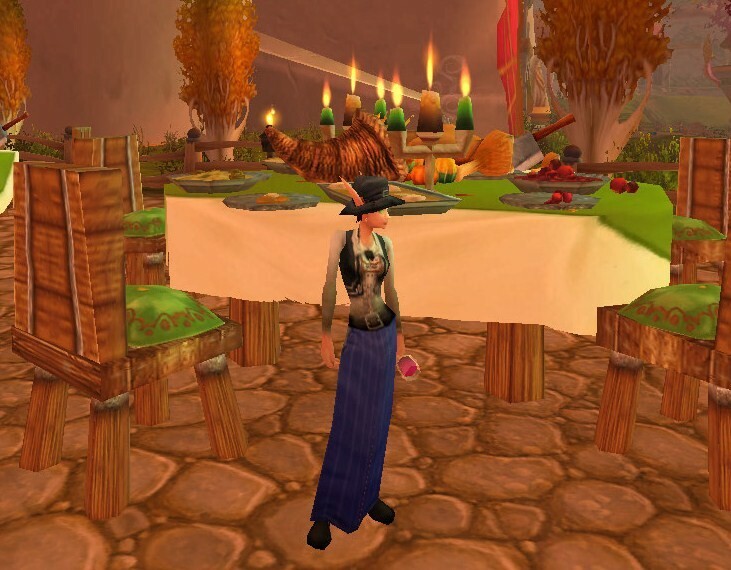 I used this similar tactic in my Hallow’s End Outfits article. Some shirt/lovely dress pairs are very pleasing. The same outfit only with the substitution for the Formal White Shirt. The same outfit only with the substitution for the White Tuxedo Shirt. This next robe was seen in my Dating Outfits article. 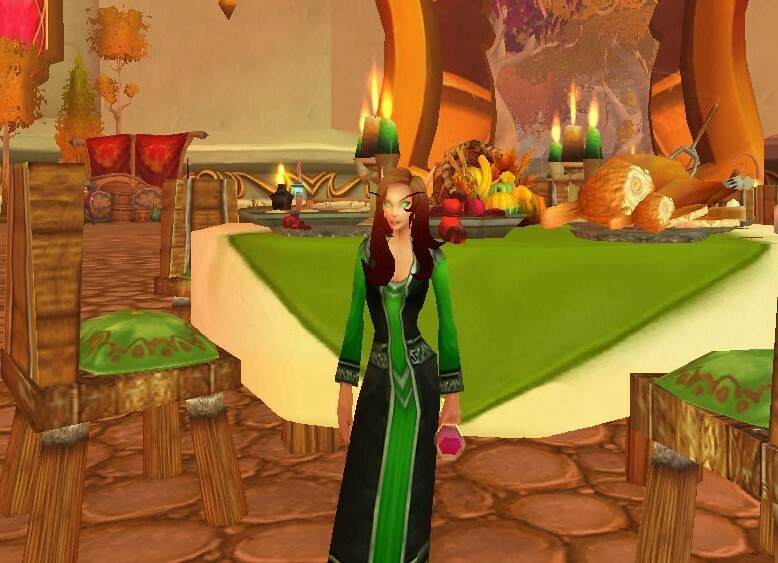 Its dark velvet touches with a splash of green (that almost matches the “Bountiful Tables'” tablecloths ^_^) is perfect for evening dinners during the Pilgrim’s Bounty event. 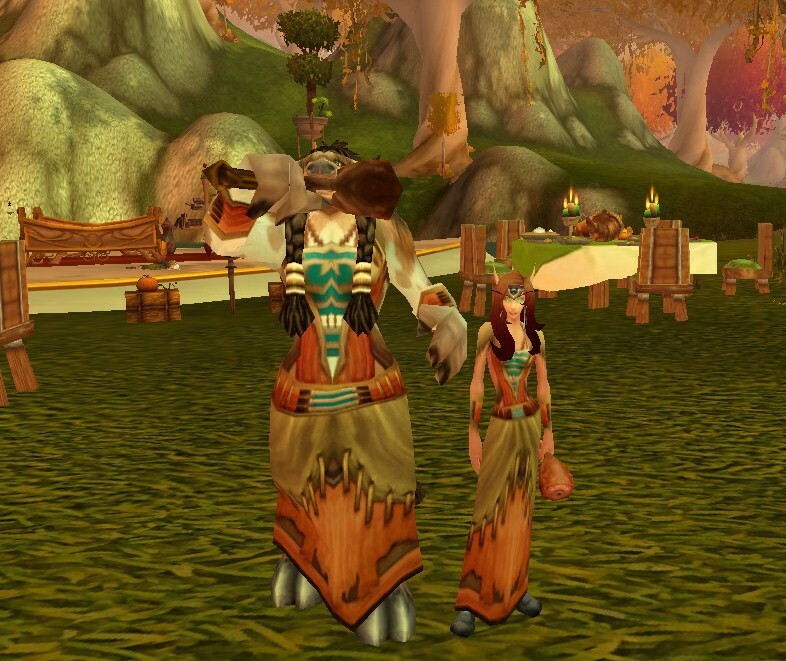 The Beastwalker Robe has a relatively high percentage to drop from one rare mob found in Duskwood – Nefaru. The other robe that shares this black velvet style is aptly named, Black Velvet Robes. The only difference between the two is that the Black Velvet Robes has sleeves. But, one can always wear the Stylish Black Shirt underneath the sleeveless Silver-Thread Robe, which creates a perfect match. Other robes in this style are ones like Robes of Arcana (blue) or the Sacrificial Robes (orange). Both Simple Kilt outfits, or anyone that you may create, is perfect day-time, casual “snacking” clothing. 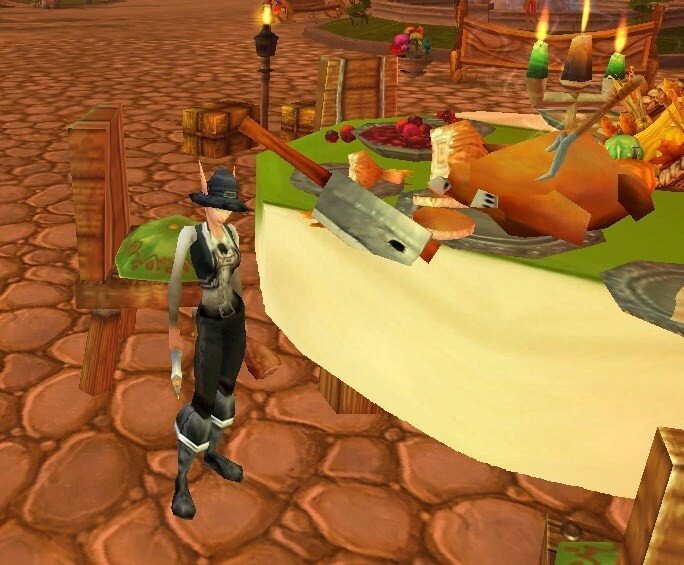 And with all the cooking you’ll be doing, make sure to buy some Bountiful Baskets – combining it with all of this event’s foods creates a Bountiful Feast. This is similar to the group-loot foods, like the Fish Feasts and Great Feasts. It’s also similar to a world-event wish I had, but not a permanent item, even as feast food (oh well…and it’s not like I had any impact on it being in-game anyway ^_^). I hope everyone enjoys this new world-event as much as I will. Happy Eating!